Music by Venus in Furs & DJ EZ Lou. Featuring a fangsmith, custom clothing and leather vendors and ZaZa the Bendable Girl. 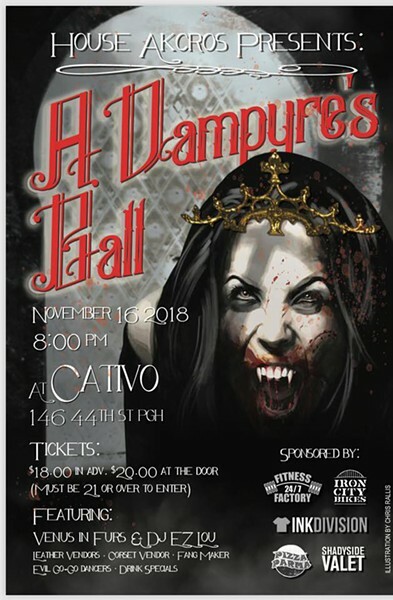 The themed event dress code welcomes vampire attire (think Venice Carnivale in New Orleans) including top hats, corsets and cloaks, steampunk and creative costumes. Classic black suits and/or cocktail dresses also welcome. Masks and fangs encouraged. No streetwear, caps, jeans or anything depicting neo-Nazi or fascist symbolism.